With over 30 years' live band experience, starting with singing and playing in many pop bands. 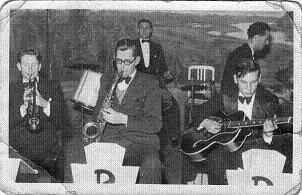 Steve was eventually drawn back to his jazz roots - his uncle playing with, Ted Heath, Felix Mendelssohn and the late great Louis Armstrong. 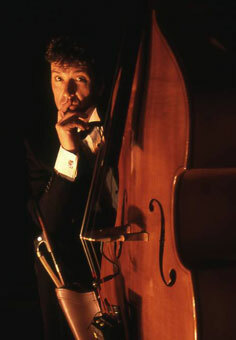 When Steve changed from electric to double bass it brought a whole new style to his playing . He started The All Stars 13 years ago and brings pizzazz and great showmanship to the band. Trumpet A very strong trumpet player with much experience and discipline, he gives the band edge, strength and leadership. Angus has excelled with variety and conviction in his thirteen year period with the All Stars. 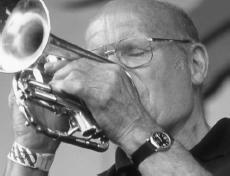 His knowledge of Dixieland and New Orleans music is a major contribution to the variation in the band. 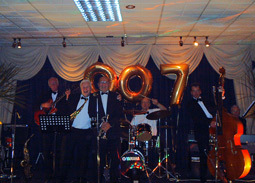 Has worked in the South West for the past twenty years in jazz and function bands. His musical passion for swing and blues music add a strong influence to the band's sound. Dave's humour, sensitivity and performance make the band swing. 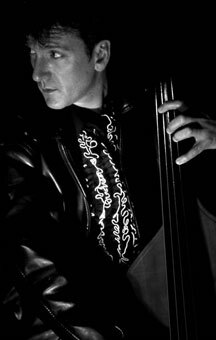 Jim Newton plays drums in a wide range of styles including Dixie, Mainstream, Modern, Big Band, Latin, Jazz-funk, Rock, Pop & Blues. 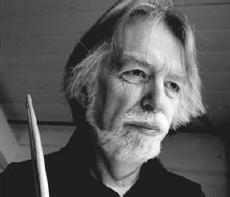 Jim is a very experienced and talented musician having played drums since 1962 and worked with a “who’s who” list of names in the jazz world. As a “listening” drummer Jim provides driving yet sensitive ensemble work, as well as inventive solos, ensuring that his drum skills are in constant demand. 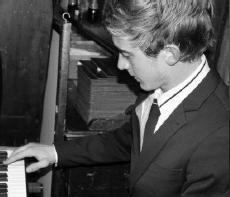 Matt Carter is a young emerging pianist, and has quickly become one of the most in demand pianists in the South West. 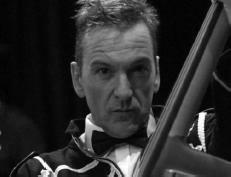 He has a wide range of experience from pop to musical theatre, but his biggest passion is playing jazz. 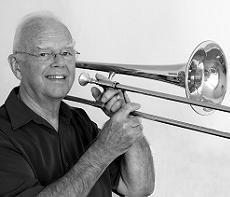 He fits in well with Steve Tucker and the All Stars due to his great swing feel and his colourful improvising. Matt takes over the main piano role in the band. You can also see Matt playing regularly with the international superstar Joss Stone. We welcome him and we are sure you will enjoy his flair and enthusiasm at all our gigs. 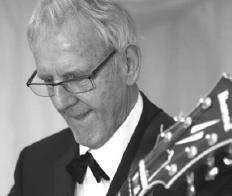 Guitar During a long career as a semi pro musician John has played many styles of jazz including Trad, Mainstream, Swing, Latin and Contemporary and has played alongside many of the top jazz musicians in the West Country. His love affair with the guitar began at the age of 10 and he now has a collection of 11 instruments. After taking early retirement from his ’proper job’ 2 years ago, John now focuses on playing with Steve and the Band and teaching. Terry Williams joined the band in 2016 and has been a big contributor to our front line. He has played in many bands including The Beachcombers. 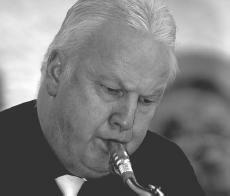 He also has shared the stage with top musicians Kenny Baker, Jack Parnell and Kenny Ball to name a few. He also currently plays with the Milenium Jazz Band. His musical versatility is very welcome in the current line up. We keep this picture of Dave Soby on our band page as he was the original founder pianist of the band. He sadly passed away on the 17th of May 2014. He was an extremely talented professional jazz, stride, boogie and blues pianist and very loyal member of our unit but more importantly a very close friend of all the existing and past members. 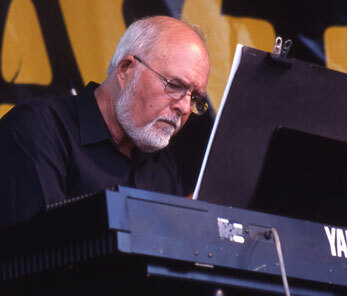 Dave can be heard on many recordings of the band. RIP Dave Soby you are sadly missed. 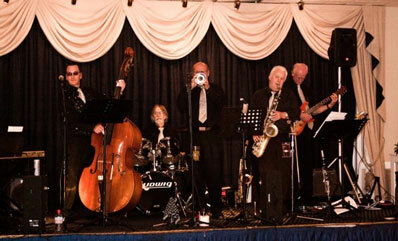 Six experienced, professional Jazz Musicians come together from Devon and Cornwall to complete this versatile, highly entertaining premier South West wedding reception, function and festival band. Their extensive repertoire draws from the popular music and songs of the 1920s, 30s and 40s, including classics from the songbooks of Gershwin, Rogers and Hart, Hoagy Carmichael, Duke Ellington, Sammy Kahn with a rich selection of Fats Waller, Louis Prima and Louis Jordan material to the New Orleans hits of the era. The boys stretch themselves in range, from providing a full acoustic marching parade band at carnivals to a tight, well rehearsed wedding function band ready to get your party off to a swing. 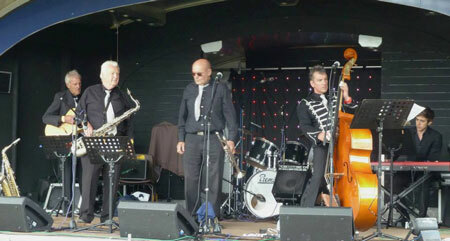 They appear regularly at the Landmark Theatre in Ilfracombe, North Devon and all over the West Country (see gigs page). People just love to dance to our band! Click on video to play. Above is a picture that Steve would like to include in his website as he is very proud of Peter's achievements. It is a picture of his uncle Peter Boyce, jazz guitarist and fellow family musician. Peter played in many diverse jazz bands from Edmundo Ros, a Latin American outfit to Felix Mendelssohn, a popular Hawaiian act. He played regular gigs at the Rendezvous ballroom in Chertsey, played with the world famous Ted Heath Orchestra in Hammersmith, London, and to top the list filled in as a rhythm guitarist at the Melbourne town hall in Australia backing Mr. Louis Armstrong.